A long time ago I was reading an issue of Saveur and saw an article about a trendsetting bar in Portland. The bartender at the joint had started making enormous blocks of smoked ice for his cocktails. When a patron ordered a drink that called for the smoked ice, the bartender would chip off a large chunk and place it in a glass with the booze. Then, as the ice slowly melted, the drink would take on more and more smoky notes, and the flavor profile of the beverage would change with every passing sip. I'll be honest, when I first read that I thought it was a bunch of you-know-what. Smoked ice? Are you really supposed to be able to taste that? Yet it stayed on my mind until I tried it and... pardon the pun, but holy smokes! That stuff is good! And it's incredibly easy to make. For this step, you'll need a pan that's safe to go on the grill. A roasting pan works perfectly, but I use disposable aluminum pie tins. Whatever you choose, make sure the sides aren't too high; you don't want to restrict the smoke's access to the ice. 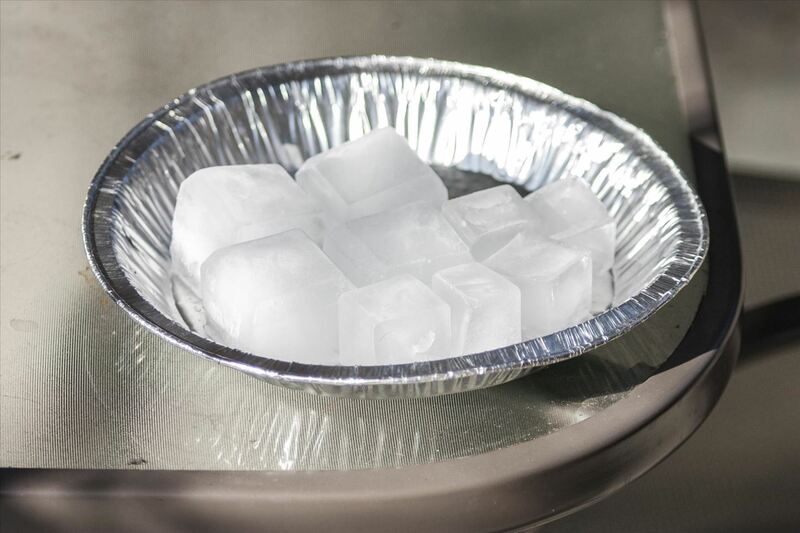 Fill your pan with as much ice as you want, so long as the ice won't overflow when it melts. You might be asking, why start with ice instead of water? There are two reasons: the first is that cold temperatures attract smoke molecules, meaning that ice is going to capture more of the smoky flavor than water would. The second reason is that if you start cold, you can smoke your ice for a longer period of time before it begins to evaporate. If you have a home barbecue, set up two-zone grilling (see tip #10 in this guide), and place your pan of ice in the indirect heat. Add some smoking chips (mesquite will give you the strongest flavor), put down the lid, and let your ice smoke until it has melted and started to heat up. 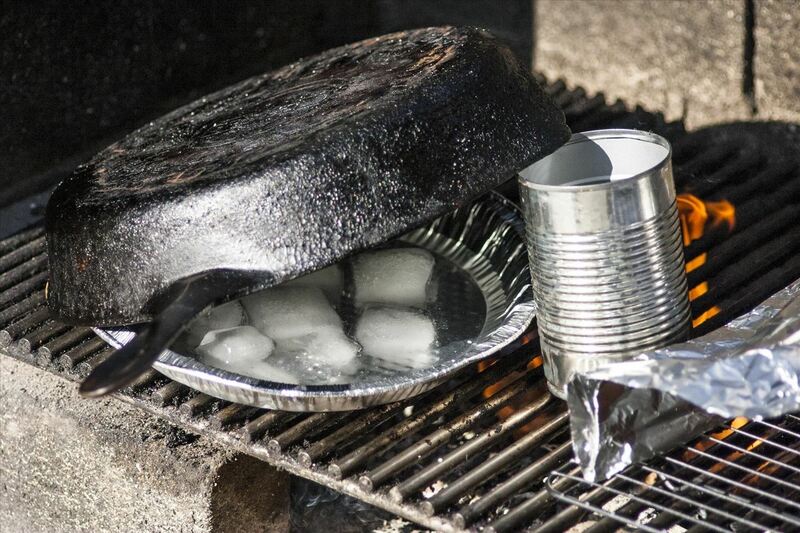 If you only have a picnic grill, like I do, then find something to act as a lid for your pan; you'll need to trap as much smoke as possible to really flavor the ice. I used a propped-up cast iron skillet, and it got the job done. Now that the ice has turned into water, it's time to reverse the process. 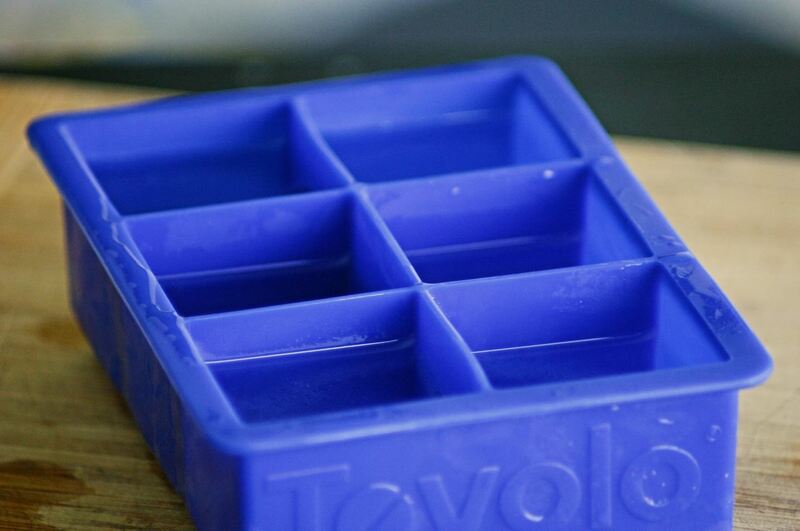 Pour the smoky water back into the ice cube tray, and return it to the freezer. Once the ice is frozen, it's ready to be added to an alcoholic beverage. I'm quite fond of it with straight whiskey, but I also enjoy it with Manhattans and Bloody Marys. Whatever you do, drink it slowly; the drink will really change as the ice begins to melt and the smoke mixes with the beverage. 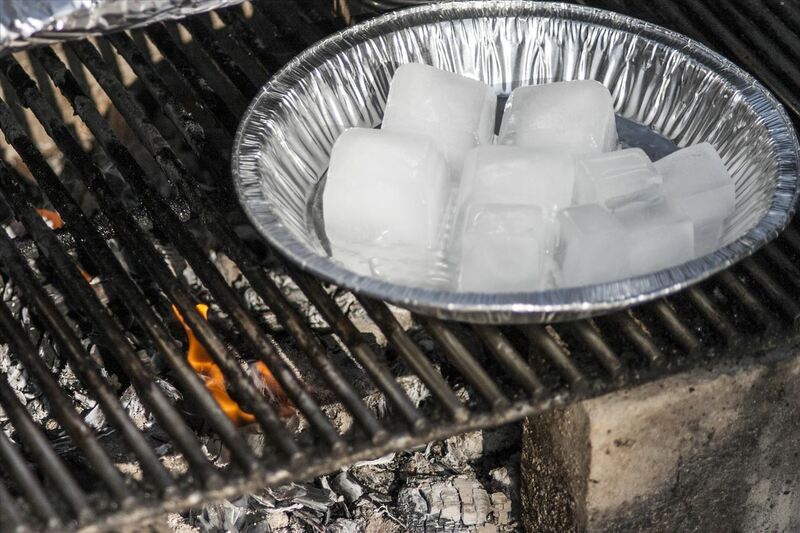 You can bring extra flavors to your ice by adding flavorful ingredients to the grill at the same time as the smoking chips. Herbs such as rosemary will impart a glorious flavor into the ice, and make for cubes that pair perfectly with gin and vodka. 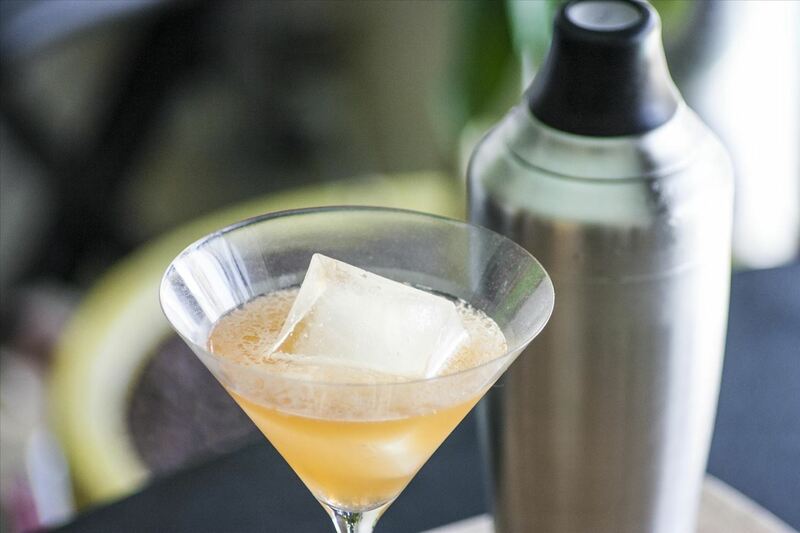 You can even use lemon or grapefruit peel to add a smoky tanginess to your ice. you mix liquid smoke mesquite flavor with water and freeze. That's all you do... This is insane. Liquid smoke can have a harsh flavor. This method seems to make it more subtle than harsh, in my experience. All depends on the end result you want in your drink. Dale - good tip. Liquid smoke certainly works well if you want the fastest result, but flavor wise it is not the same. As Eliek said, definitely more harsh. I love liquid smoke, but there's a reason that we have BBQs and grilles; they do provide a different flavor.